Water on Earth is in constant, large-scale movement: sea water evaporates into the air and condenses into clouds. The clouds shower rain on the ground. The water drops drain to puddles, ponds, and rivers, and rivers, as we know, eventually flow into the sea. But evaporated water is, of course, fresh water; salt is added as the water dissolves minerals in rocks and in the ground, and carries them to the sea. The water continues to flow through the water cycle, but the salt, which does not evaporate, remains in the sea. Sand grains are no more than tiny pieces of rock (more specifically, the exact size range of sand grains is 0.05-2 mm). The sand on Israel's beaches originated from rocks in Africa eroded by the Nile and carried into the Mediterranean. Larger rock chips sink in the river bed along the way, leaving only the smaller grains, which flow with the water, to reach us. The sand composition depends on the rocks it came from, and the sand carried to Israel's beaches contains mainly – some 90 percent, to be exact – silicon dioxide. The rest are calcite – a mineral consisting of carbonated calcium – from skeletons of marine animals (7%), and iron and other minerals (3%). The sands of Northern Israel have a different composition, as they originate, in a large part, in local rocks. For thousands of years, sand, which contains a high percentage of silicon dioxide, has been used to make glass. In 1891, Baron de Rothschild founded a glass factory on Hof Dor, to manufacture glass wine bottles for the wineries in Rishon LeZion and Zikhron Ya'akov. The factory was closed a long time ago, but the old factory building now serves as a museum. Let's clarify this issue first: to hear the sound of the waves, you cannot use just any shell, only a conch shell. And even then, you will not actually hear the sound of the waves, but rather, low-frequency surrounding noises that are amplified by the structure of the conch. The shells and conches we find on the shore are the remains of animals from the Mollusca phylum. These have soft bodies that are covered in mucus. The most common seashells on the shore come from the outer shell of bivalves (clams, oysters and mussels) and snails. Sea snails are very similar to the land snails we are more familiar with. They have a muscular foot and a pair of tentacles, breathe oxygen that is dissolved in the water through their gills, and carry a shell on their backs. Many snails can withdraw into their shells at times of danger. Some of the most common snail species inhabiting Israel's shore include the Mediterranean limpet, the turbinate monodont, and the murex snails. Researchers believe that in ancient times, murex snails were used for producing purple and blue dyes. These dyes, which are mentioned in the bible, were used for coloring expensive fabrics. The murex snails are predators and one way to catch them was to place baskets containing meat bait in the water. The murex snails attack their clam and snail prey by perforating their shells and inserting a toxin called murexine. This toxin degrades the enzyme acetyl-choline esterase that breaks down acetyl-choline, which transmits neural signals to the muscles. Without the enzyme, acetyl-choline is not broken down, and the neural signal cannot be renewed, thus leaving the prey (fish, mollusks, and crabs) paralyzed. Murexes have been also known to engage in cannibalistic behavior, so if you find a perforated murex shell on the shore, it is possible that it was another murex's dinner. The precious dye is produced from a mucus gland in the snail's body. The extracted fluid acquires its distinct color after sun exposure. However, most of the shells on our shores originate not from snails, but rather from a different group of mollusks – the bivalves. Bivalves’ shells are characteristically comprised of two hinged parts, each called a valve – hence their name. When a bivalve dies, the organic material connecting the two parts disintegrates and they separate. Most bivalves are relatively small, and so are the shells that we find on the shore. However, there are also species of huge bivalves that can reach a width of 1.5 meters and a mass of 200 kilograms. 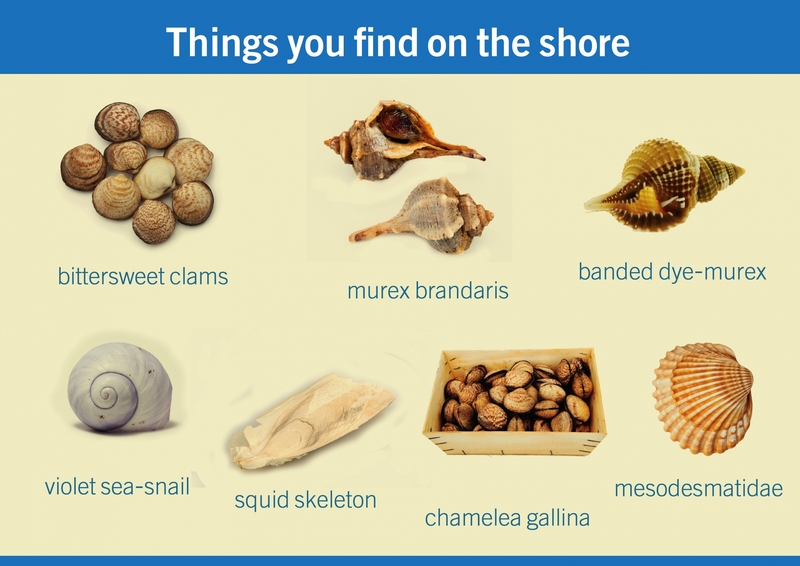 The most common shells found on Israel's shores are the bittersweet clams (Glycymeris), especially Glycymeris nummaria. While their brown-and-white shells are very common and familiar to Israelis, living clams of this species have not been locally documented in over 50 years. The species is extinct in the region, and the entire genus is endangered. If there are so many bivalve shells on the shore, where are all the pearls? Well, very few species of bivalves can actually produce pearls, and these usually have a shiny internal coating called nacre, or mother of pearl. Pearls form when an organic irritant or a grain of sand penetrates the shell. In response, to protect itself, the bivalve mollusk secretes a mixture of calcium carbonate, water, and the protein conchiolin. This mixture – nacre or mother of pearl – creates a stiff and shiny layer around the foreign object. The foreign object coated by a thick layer of this shiny material is the pearl. As your lay your towel on the beach this summer, you will know why the sea is salty, what is the connection between the sand under your feet and your glass bottle of juice or wine, and also where the seashells came from. Have a nice swim (after making sure a lifeguard is on watch)!